He became convinced I was a reincarnation of someone in his past. And over time, after more incidents, my mother – a very sane and logical woman -- also came to believe it. Reincarnation was an idea I grew up with that my mom and I talked about and researched together. For years, I wanted to write a novel about someone like my mother – who was sane and logical – who started out skeptical but came to believe in reincarnation. But I was afraid if I did people would think I was a “woo woo weirdo”. Then a few years ago on the exact anniversary of my mom’s death my niece, who was a toddler at the time, said some very curious things to me about my mother and I – things she really couldn’t have known -- and the pestering became an obsession. Josh Ryder, the main character has my mom’s initials, her spirit and her curiosity and like her, he’s a photographer. But there the similarities end. When Josh starts having flashbacks that simply can’t be explained any other way except as possible reincarnation memories he goes to New York to study with Dr. Malachai Samuels -- a scientist and Reincarnationist who works with children helping them deal with past life memories. The book has garnered stars from both Publisher’s Weekly, Library Journal and is a BookeSense pick for September. It was on the Booksense list in the US for Sept and on the 2007 Highlights list. I think of all my books, this is the one my mom would be the most proud of which is fitting since it’s really the one she inspired. 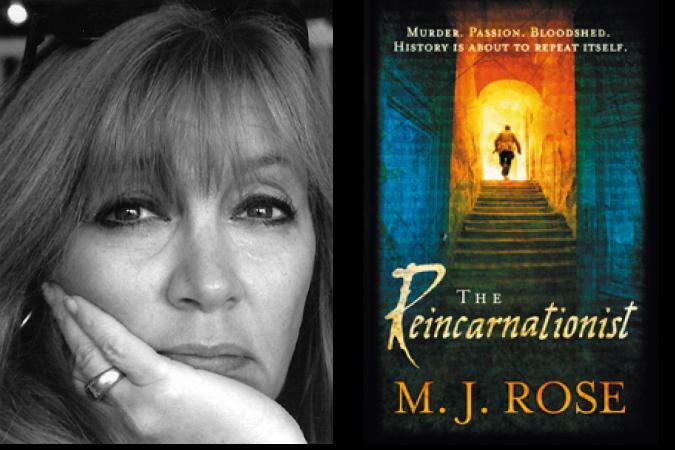 Please visit my website: www.mjrose.com for an excerpt, an interview with me about the book, a booktrailer and more. As well please visit www.reincarnationist.org - a blog I've set up to discuss the subject and report the news.